When Vincent Van Gogh died in Auvers-sur-Oise, France in July 1890, he left behind so many burning questions. How did he die? Was it a self-inflicted gunshot wound or homocide? And why was the gun never found? How did Van Gogh ever manage to complete over 70 dazzling paintings in just 70 days in Auvers? It’s all such a mystery. 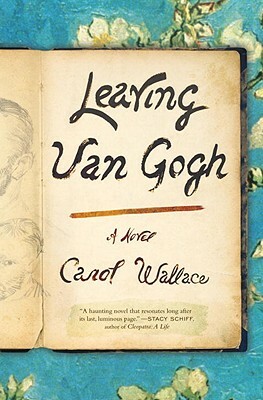 In the novel Leaving Van Gogh, Carol Wallace takes on the legend of Van Gogh’s last 70 days through the eyes of Dr. Paul Gachet, a widowed doctor, painter and art collector who owned a country house in Auvers. Wallace’s theory – buy it or not – is that the smoking gun belonged to Dr. Gachet. Van Gogh followed his doctor’s orders, pouring out such wonders as The Church in Auvers, Dr. Paul Gachet, Wheatfield with Crows from May through July, 1890. 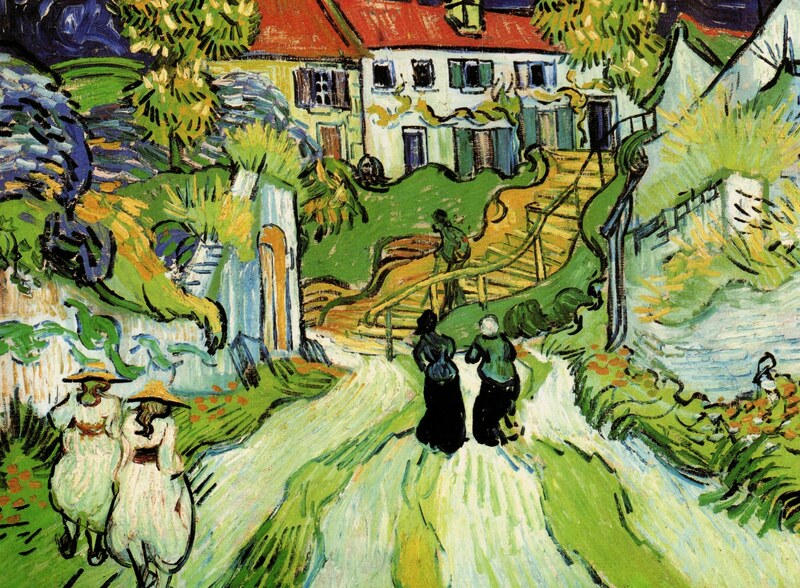 Wallace’s book is nicely researched, from Dr. Gachet’s 19th century medical training at a women’s psychiatric hospital in Paris to the details of Van Gogh’s brief painting history in Auvers. But more than that, Wallace captures the intensity of Van Gogh’s genius and madness, the creative spark behind his strong, bold colors and swirling brushstrokes. 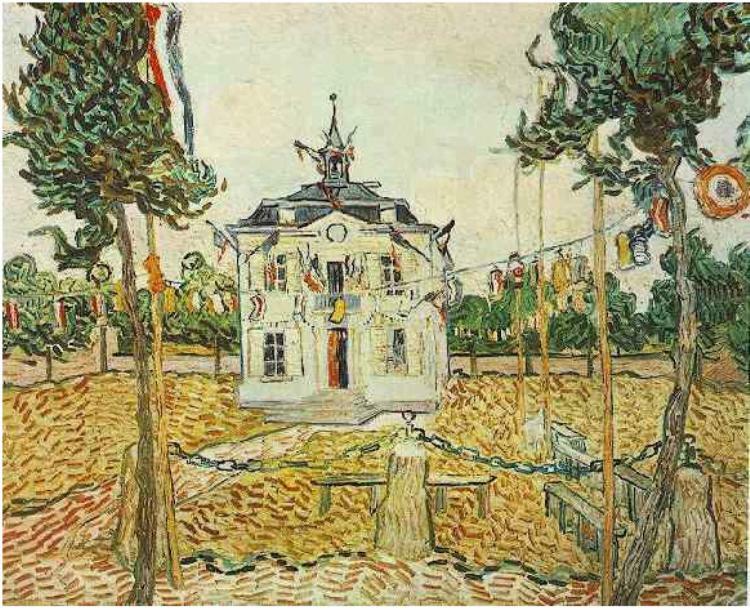 She appraises Van Gogh’s art through Dr. Gachet’s eyes, who trained and exhibited as an artist. No doubt it helps that Wallace is herself an art historian and knows her way around paints and palettes. I had not seen the painting of the church that he had mentioned and was curious to know how he had portrayed it. . . . The sky he painted in several shades of blue, the darkest of which almost matched the color of the stained glass. The result was that the building seemed to be a mere façade, as if we were looking through the apse to empty blue air beyond. And this was not all: the stonework of the church, so rigid in life, became flexible under Vincent’s brush. The rooflines wavered. The tower tilted. The space of the apse seemed swollen. Gray stone was touched with dashes of blue and green, as if the surrounding grass were beginning to swallow the dissolving structure. Leaving Van Gogh has it all: wonderfully artsy writing, accurate art history and a compelling human story. It’s also a moving contemplation on how to care for those who suffer from mental illness. The circumstances of Van Gogh’s death would make for great book club debates, especially if you ambitious enough to compare Wallace’s theory to that propounded in the recently released, 900-plus page biography called Van Gogh, The Life by Steven Naifeh and Gregory Smith. 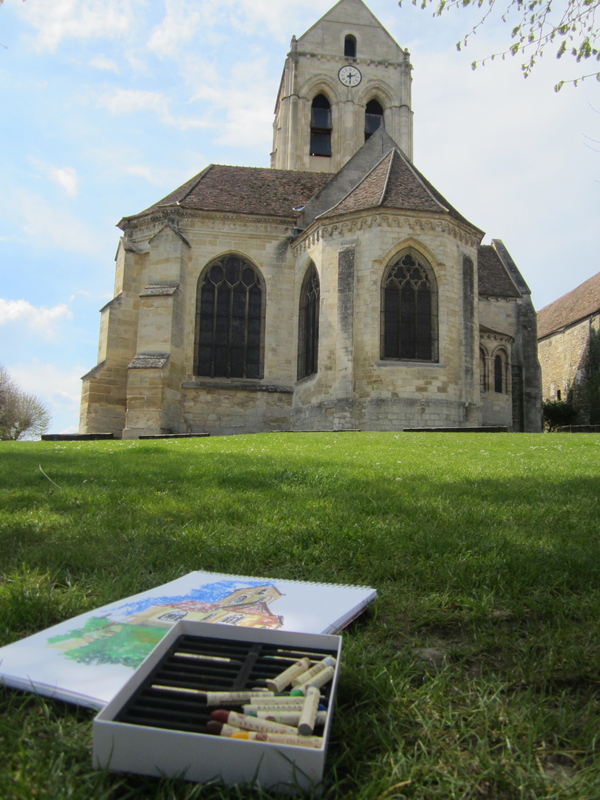 With Wallace’s book and my sketchpad in my tote bag, I ventured off to Auvers-sur-Oise myself. I hoped to see some sights that Van Gogh had painted, and thought I’d find some of the scenes from the book, but I never expected to have the book and Van Gogh’s story came alive right in front of my eyes. 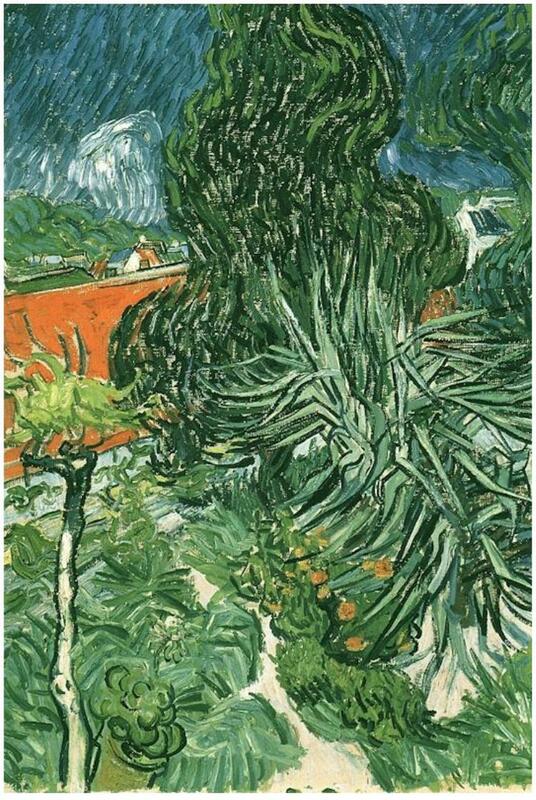 Check out these photos and these images of Van Gogh’s paintings and you’ll see what I mean. 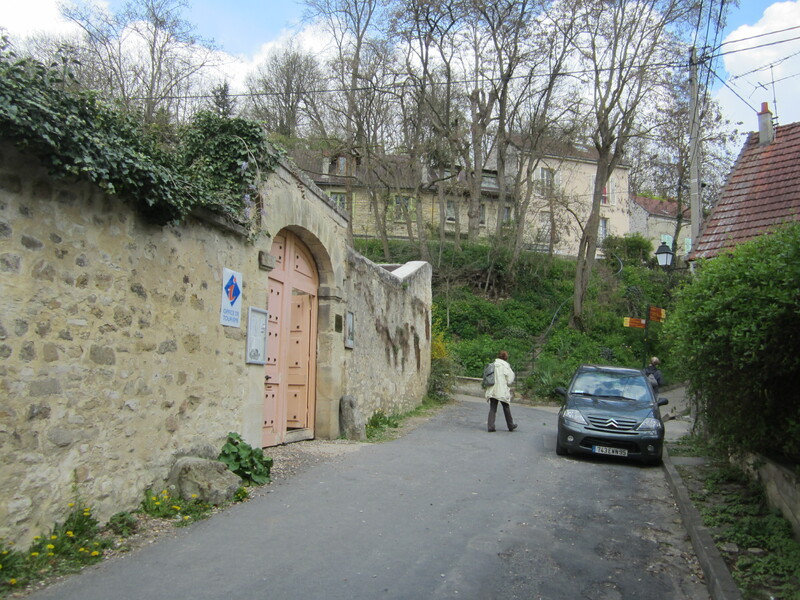 Dr. Gachet's house, now a museum in Auvers. Note the palm tree in the garden. 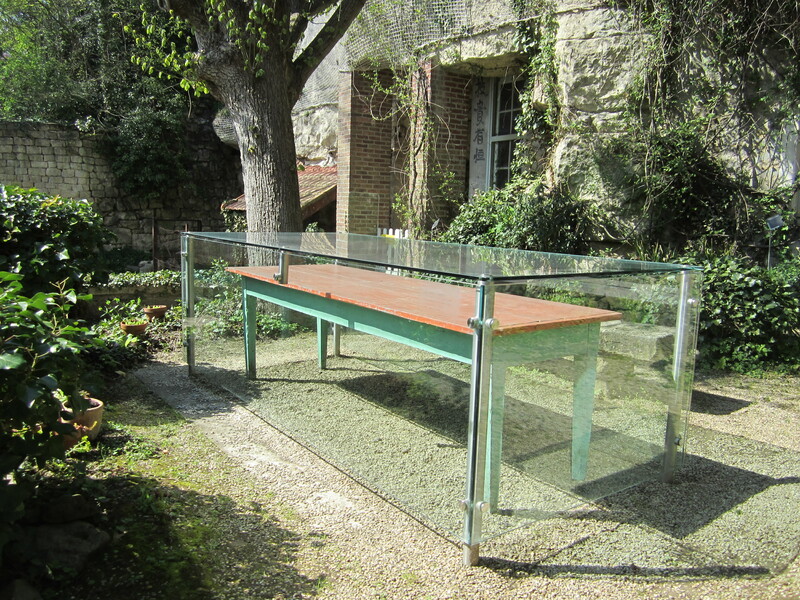 Van Gogh painted the garden facing the other direction. 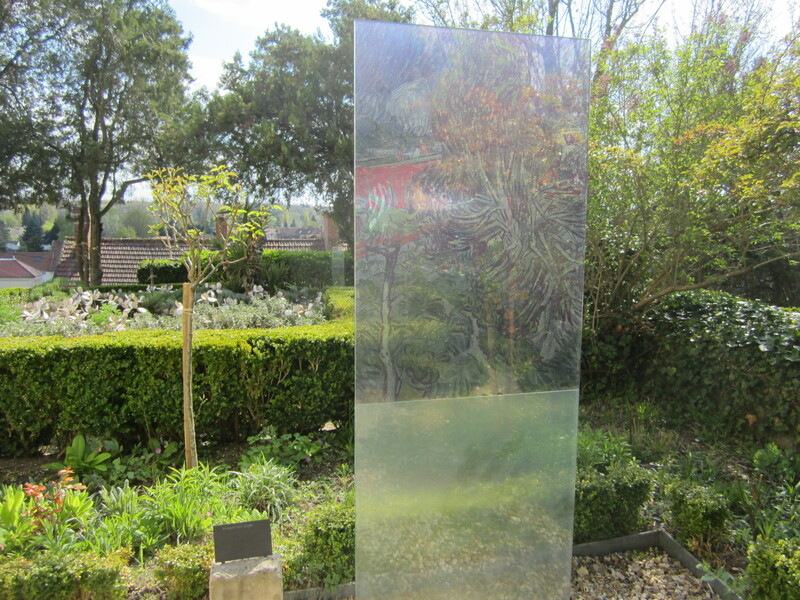 Dr. Gachet's garden today, with see-through screen of the painting to enhance the view. A few travel tips before you go. 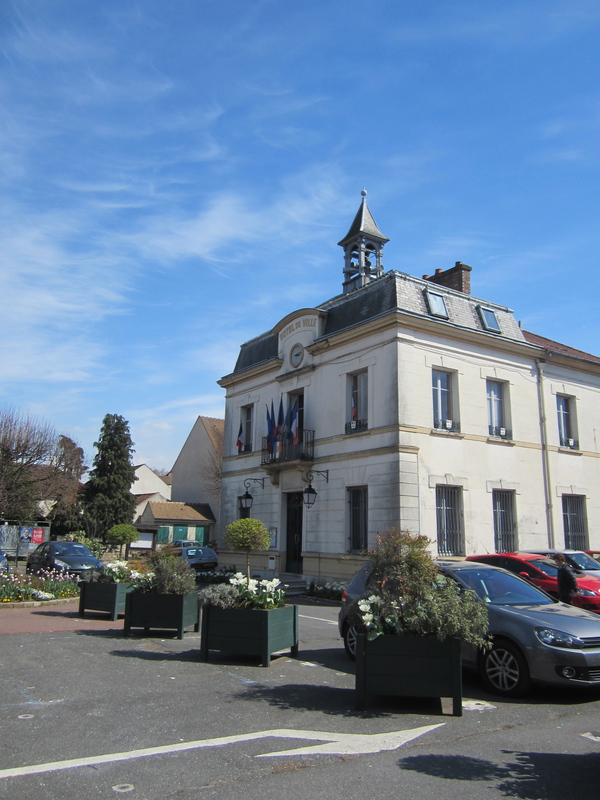 There are trains from Gare St. Lazare And Gare Nord to Auvers, but during the week there is a connection through Pontoise. On Saturday there is a direct train. Check the SNCF website for ticket and schedule information at http://www.transilien.com. 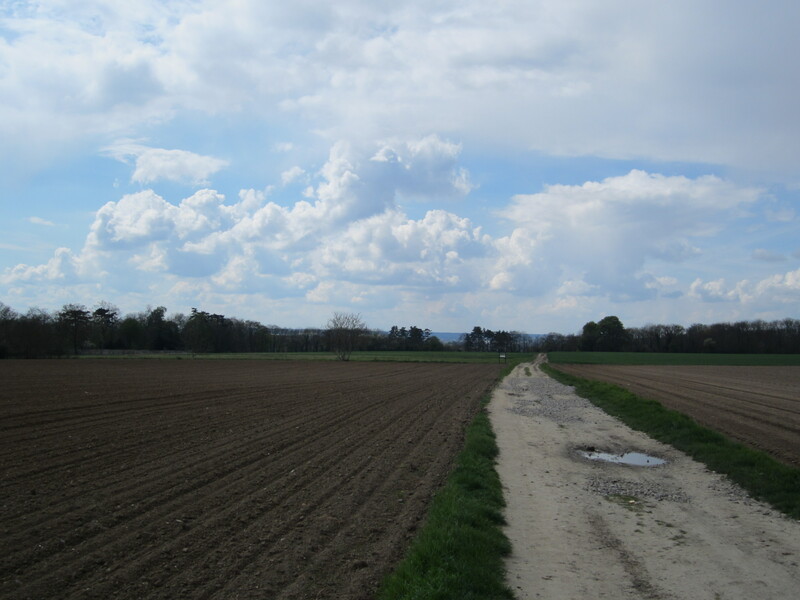 I chose to rent a car and drive out to Auvers. 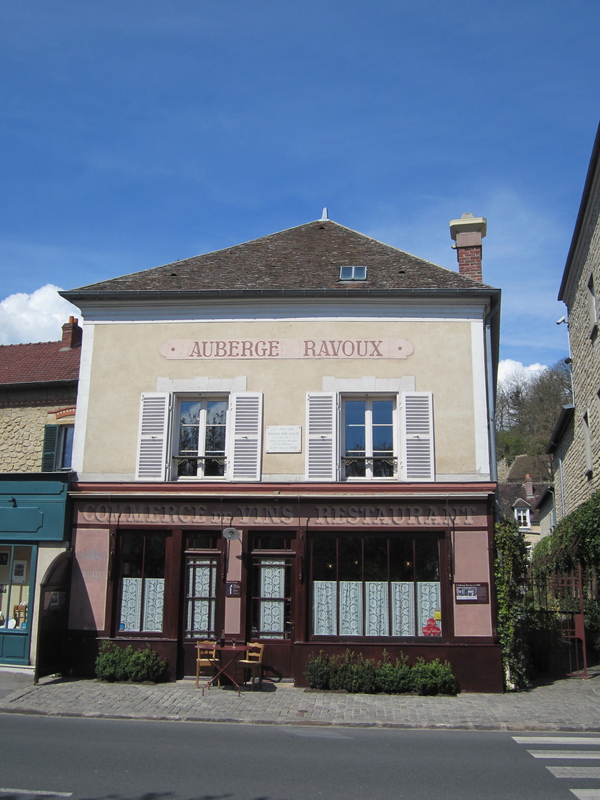 Once I got to Auvers, I was glad I had driven, because even though the train station is close to Auberge Ravoux and Maison Van Gogh, it would have been about a mile each way to walk out to Maison Gachet. I’m a good walker, but I’d gotten a late start, and I had already had a nice walk up the hill from the Auberge to the church and the cemetery. The Maison Van Gogh website has a map, so you can decide for yourself. 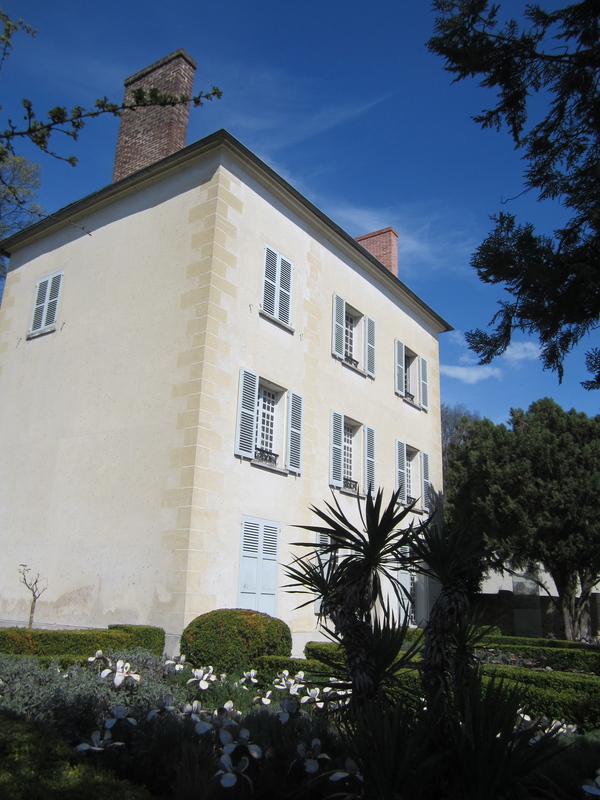 Maison Gachet has just been repoened after a five year renovation, and it’s a beautiful museum – a site you really don’t want to miss. From March 1st through October 28th, they are open Wednesdays through Sundays, but check the websites for holidays and hours. By car, take the A15 motorway, direction Cergy-Pontoise, exit number 7 (Saint-Ouen-l’Aumône) then the RT184 direction Amiens-Beauvais. Exit Méry-sur-Oise/Auvers-sur-Oise. Once in the village, follow directions for Auvers-sur-Oise. I highly recommend you pair your trip with Leaving Van Gogh by Carol Wallace. 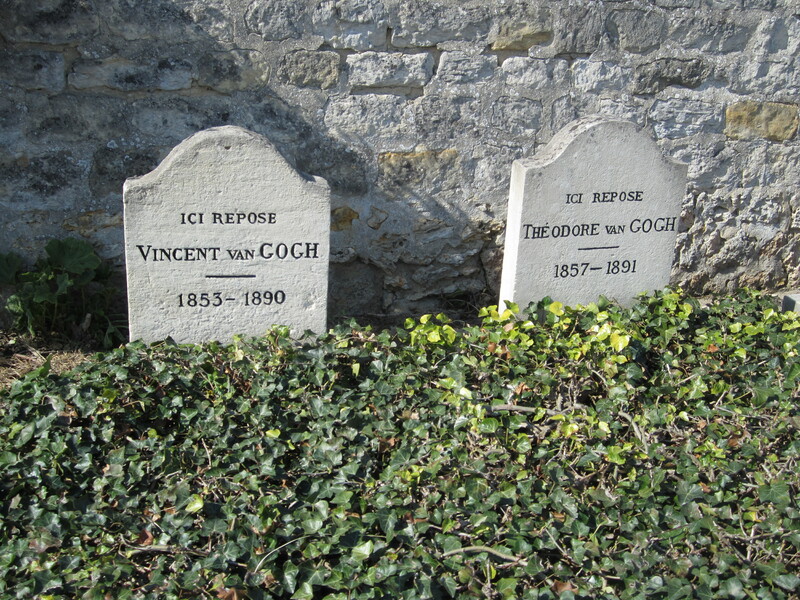 This entry was posted in Art History, Art History Site, Book Review and tagged Art Travel, Auberge Ravoux, Auvers-sur-Oise, Book club travel, Carol Wallace, Dr. Gachet, Impressionism, Leaving Van Gogh, Paris Day Trip, Vincent van Gogh by americangirlsartclubinparis. Bookmark the permalink. Thanks for that quote – I’ll think of it when I see Starry Night. Also, you and Dr. Gachet share that unusual doctor-artist mix! What a brilliant blog, I’m really looking forward to going back through your posts. Thanks for the recommendation! I discovered you while blog hopping but thought I’d leave my comment here as you might be interested in this post of mine: the Van Gogh and Gauguin light show at Les Baux – quite extraordinary. All the best. I really loved Van Gogh’s tomb covered in ivy. So much better than cold stone. I’m a great Van Gogh fan and went to see a huge retrospective in Amsterdam many years ago. I’ve also been to Arles. Auvers is definitely worth a visit.